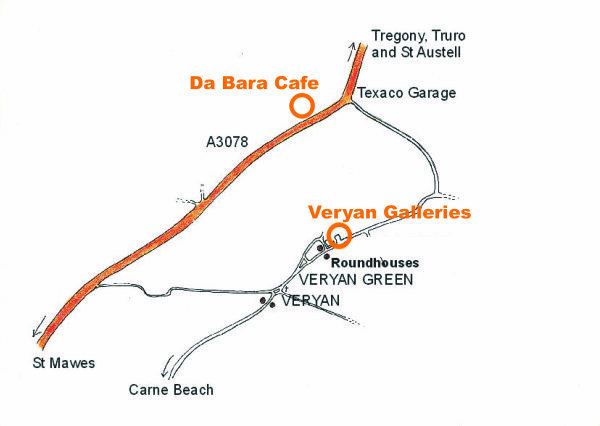 Veryan Galleries is situated between two of the landmark roundhouses in Veryan Green. From the centre of Veryan simply walk past the village pond and continue uphill, past the green on the left and we are straight ahead. Take the A390 to Truro then turn left onto the B3287 to Tregony. Go through Tregony and turn left at junction signed to St. Mawes. After 2 miles turn left at Texaco Station, signposted to Veryan. Continue on this road to the village, (do not turn off as some sat. navs indicate!). We are the first property on the right after the 30mph signs.